Woven/Longhouse Publishers & Booksellers, 2011. Yokel: A Long Green Mountain Poem. Longhouse Publishers & Booksellers, 2011. I'm in Love with You Who Is in Love with Me. Longhouse Publishers & Booksellers, 2012. ISBN: 1929048114 (Library of Congress). 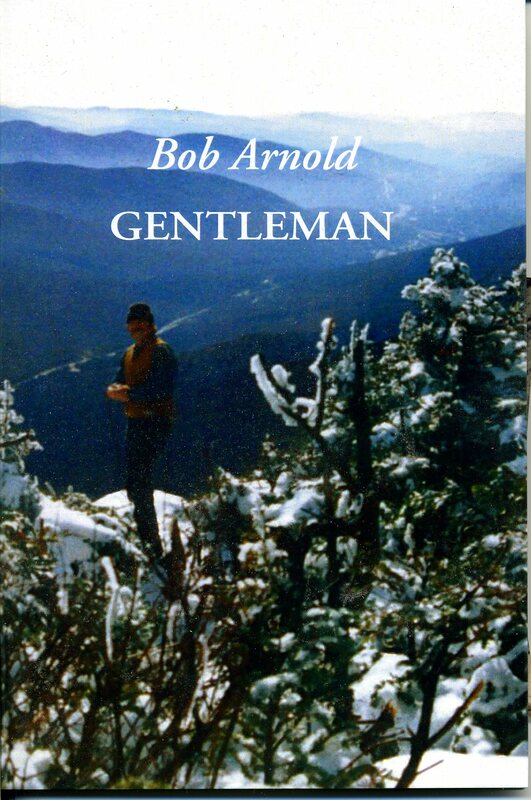 There's nothing imagined about Bob Arnold, and yet his whole life has been the product of imagination, and imaging a life that is as forceful as a wood chop, as clear as a woodpecker's call, as circular and varied as tree rings, as fragrant as a strip of cedar wood. Arnold's a master stonemason; a builder in the old ways of form, function, and perfect fit; a friend to chainsaws, pick-up trucks, stonecutter's tools, rivers, and grosbeaks; a lover of women (one woman in particular for over forty years); and a man's man—meaning the kind of man that knows himself and who you are (male and female or whatever new way you define yourself) and welcomes whatever that is with equanimity and generosity round the campfire. But Arnold's also one of the finest poets writing in America, one of the cleanest and purist, and without self-aggrandizement. Although he's been published by some of the finest small presses around, and at this point in his life is probably well known in the poetry world beyond his close cadre of admirers, he still keeps himself whole and wholesome in his country Vermont retreat, with wife and soul-mate Susan. You won't find him bandied about by the academic world or the slick world of poetry celebrity, and he still publishes many of his books himself, but Arnold is the real thing. The thing that lasts. That sticks. That will be as solid a long time after the celebrity poets have slipped into storage stacks. Arnold, too, has earned a deep appreciation from many poets and writers, including myself, for his Longhouse poetry publishing projects and his blog postings about poetry, literature, art, culture, and politics. His poetry reflects the kind of respect for the language, and for the world and the people and things in it, that's quite rare. It's a poetry laid down with as fine a mind and hand as the walls he builds—responding always to the lay of the land. Simple and spare when required. More discursive and filled with storytelling verve and kick when necessary. Always, however, ringing in the mind with spiritual light, the sound of a thing well-said and carefully thought-out, both visceral and enlightened, tender and spot-on, good-humored, patient, loyal, and resolute. There's a charismatic human spirit behind this work, that appeals because its charm is sincere and without airs. Each poem is a hot cup of tea on a below freezing morning, or a tumbler of cool spring water when the heat's got at you. I've never met Arnold, although I will name him as a friend, a mentor, and an inspiration for close to a decade now. So, you can take my words with a grain of salt if you want, but seek out two interviews in Jacket magazine, follow his care-taking of the estates of Cid Corman and Lorine Niedecker, and read the work. You can't disagree. The latter two of these books are part of a trilogy. Bob's words (I'll call him Bob now that I've revealed myself as one of his devotees): "The trilogy is called Woodlanders. The first two books are Yokel and I'm in Love with You Who Is in Love with Me. I'm the idiot, certainly not you, having to tell you these titles but I have to get in the groove. The third book, forthcoming, is titled The Woodcutter Talks. The trilogy covers poems and life over 40 years in the same place in Vermont, home, marriage, building work, stonework, woods river, and that psych-folk son." The Woodcutter Talks, the third book, is just out. Get it. There's no preferred order. Like the tree-rings, their order is circular. A handful of poems in the small chapbook Gentleman reappear in I'm in Love for it was published as a tribute (as many of Bob's books are) to Susan. It's a lovely thing to hold, and would make a sweet gift book to a beloved, or to a nature enthusiast. For some reason the poems herein remind me of James Laughlin's poems. I think it's the off-hand charm, the small ironies and little twists of thought and language that take the reader to a place not only pleasantly in the Now but also so richly sensual. "To have every bird in the woods / Finally sing and I am known to it / Is all the morning I ask // To see the flower garden / Move as a dress on your body / Is all the day I wish // To have the stars rise from the river / And you think of me not as crazy / Has to be the night ahead." ("To Have") There's a relaxed sexiness to these poems—I'm In Love bursts with it. Bob's love for the earth is just as vibrant and coyly robust as it is for Susan: "Early in the day / Building a house / Far from any town / With no other sound / But the river and the / Rhythm of nails pounding— / And once between raps of / The hammer I heard nearby / A woodpecker answer." ("Answer") That woodpecker sound is as naked and attractive and absorbed into the poet as Susan's body under her dress. I think of these poems as if Jean Follain might have written such if his world had not been one of such a magnitude of loss. I wrote Bob upon receiving and reading Yokel. "Dear Bob. Just a note to say how much I've enjoyed reading Yokel. The people are all drawn with such a clear plain love—a plain-spoken love drawing them out. They live on the page and, of course, remind me of many of the kind of folk with which I grew up in North Carolina country. It's the generosity and good humor of your portraits that's so compelling—and the ease with which you evoke your woodland community—and how it holds together even when the facts say it shouldn't. I love too the way you've strung the poems like a necklace of acorns around your life and the energies of Yokel, Sweetheart, Preacher, and Native making the strand. As always there are so many poems I love it would just mean listing the contents. Wisdom and storytelling all combined with your usual energy, grace, tongue-in-cheek, hand-on-hammer, hand-in-pocket, kiss on Susan's lips. I think it one of your major accomplishments." Yokel is a book about being human, how unlike and alike we are, and is built in praise of the colloquial. It's Our Town and Edwin Arlington Robinson and Frost and Whitman and Jonathan Williams' Appalachia, but not. Bob has taken his wide reading from Rimbaud to Asian poetry, from Woody Guthrie to H.D. and understands how the colloquial is the Classic, and the romance of the backwoods a philosophical inquiry into living. It's also about how Bob and Susan have, over their years in Vermont, become native, become local, while keeping their private intelligences to themselves, bringing them out for sharing with the right visitor or neighbor. Bob doesn't leave out the invasion of the modern into his idyllic countryside and a number of poems track the challenges of old colliding with the new. In "Earrings" Yokel who would "plow snow / all his life" recalls "from a heated / Cab tonight / Coffee thermos / Between his legs" seeing a pretty woman on a back road with "Four earrings in / Each ear and her / Friend had one / Stuck through / Her nose." Or as in "Old Town": "When proudly announced at town meeting / Cable was coming to the area / In the front row one old native raised an arm / Asking, Does that mean I have to get a TV?" I look forward to reading The Woodcutter Talks. I know it'll be full of pithy sayings and wise observations brought on my tree and storm and river, nail and roof and board. I'm In Love seems appropriate as middle volume for the trilogy. Susan sandwiched between their lives as neighbors and locals, and Bob's livelihood taking care of their and other's buildings and the landscape that nourishes their rural life. You got a flavor of the poems earlier. Suffice it to say, that if you are loved, or ever have been, or will be, Bob's kind of love is what you are after. Worshipful—but not to detriment, honest, playful, wise, tender, and with just the right amount of rubosto. He's Adam and Romeo, Orpheus and Odysseus, Shah Jahan and Rama. And he can build and fix whatever you want (and welcomes your help as well as a back rub), and is a perfect father too. Dante nor Petrarch loved no more: "They have been together and in love so long now / That when they think of an earlier life apart, it / Isn't possible. Or it seems another life entirely. / After all it was childhood only before they met." ("In the Land of Slush") That's the kind of forthright take-no-prisoners kind of adoration Laughlin writes too. "It was childhood only" a killer line. Everything in Bob's world is touched by Susan's presence—mittens, stray dogs, candy wrappers, and fireflies. It all evokes wonder and delight, and most of all, gratitude in Bob's eyes, manifesting in his words some of the most delightful, endearing, joyful, and spiritual rich love poems ever written.